The heart and soul of teaching is all about breaking down complex skills into bite-size steps so that children can do them by themselves. We often break skills down even further into strategies, and for each strategy there is a process, or a series of steps, that you go through to achieve a goal. 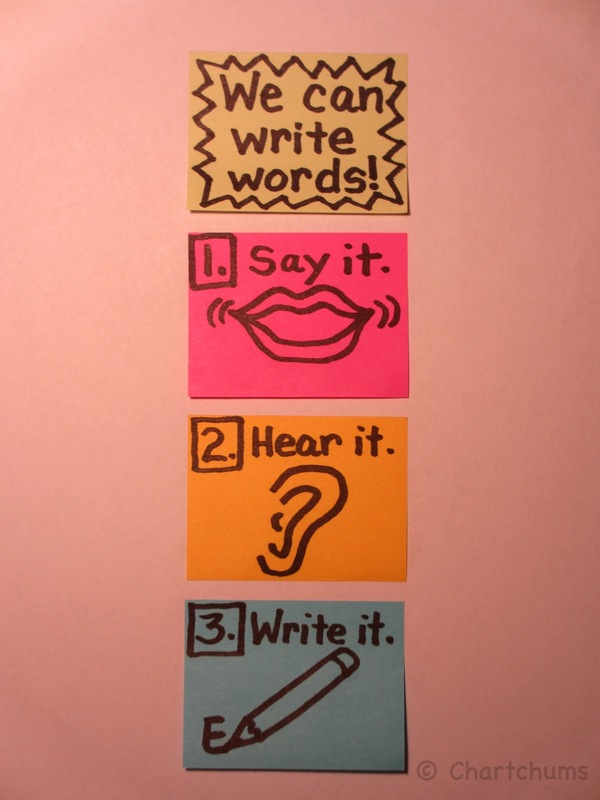 Charting these steps ensures that children have a tool at hand should they forget what to do next. We call this type of chart a process chart. The beauty of this kind of chart is that it can help us think about our unique students and plan for what will help them best understand and do the skill we have in mind. To quote Confucius, “When it is obvious that the goals cannot be reached, don’t adjust the goals, adjust the action steps.” Process charts provide such steps. We devote a whole chapter to this important type of chart, the process chart, in our book Smarter Charts for Math, Science & Social Studies. Any process requires a direction, which often leads to steps. For example, scientists go through a process whenever they are going to explore something. 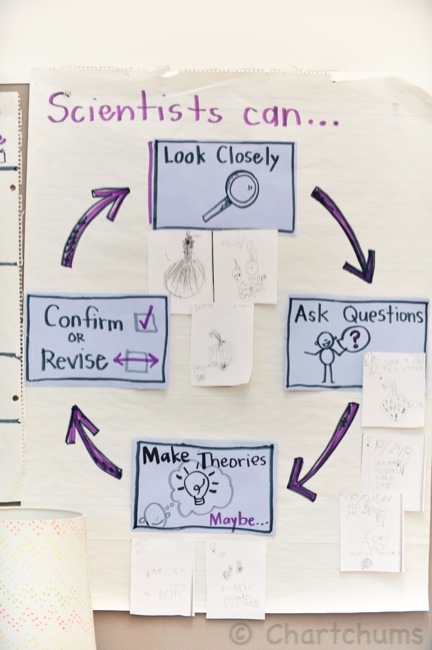 The chart, “Scientists can…” reminds children of some helpful steps in the scientific process. First, look closely. Then ask questions. Next, make some theories, confirm or revise those theories, and then do it again and again. This chart introduces the basic steps of the scientific process. Teachers know that telling kids is not the same as showing them how to do something and then giving kids lots of opportunities to practice that thing. To quote another favorite Confucius seed of wisdom, I hear and I forget. I see and I remember. I do and I understand. Process charts help children see and remember so that they can do and understand. In most classrooms, creating a community that works cooperatively and compassionately together is a big goal. But knowing how to socialize is a learned skill. With Confucius in mind, will telling kids to be nice make this happen? They need to see what this looks like and then do it themselves. 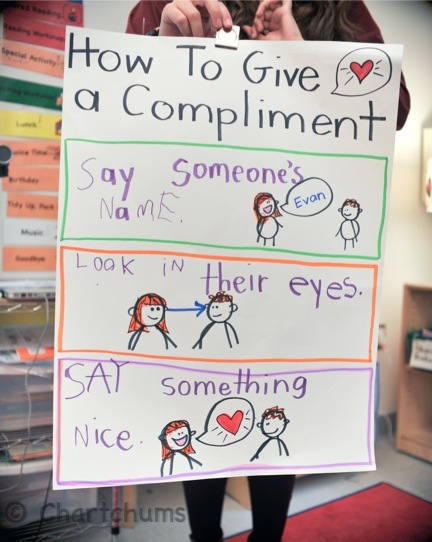 The chart below is one example of how a process chart might go that hopes to help kids be able to develop some of their interpersonal skills starting in kindergarten. Each step of the process is blocked out making each action clear and distinct. The value of process charts is not only that they remind children of each step, but they illustrate how these steps are repeatable. For example, when children are beginning to learn to write words we want them to repeat saying the word, hearing the sounds, then writing the letters that match the sounds, then doing this with each sound and with each word the child tries to write. The simpler the steps, the easier to repeat. The chart below was created for some children who were working on hearing more sounds in words so that they would start writing more letters to go with those sounds. The simplicity of the chart also makes it perfect to make as a table chart or as an individual bookmark. The icons provide quick visual reminders of the steps to follow. Process charts help teachers teach and help children learn. The key is keeping the steps explicit and clear, providing visual icons that are instantly recognized, and getting the kids to use the chart often. Eventually the children who are beginning to internalize the process can then use the process chart to teach any classmates who could also use the support. Talk about empowering kids!